One of those is stamina, or your ability to keep going for the long haul. Just as it takes stamina to continue being a great nation for hundreds of years, it also takes tremendous stamina to build the kind of life you want.Stamina is the third of the 10 Foundations of SEALFIT training. It’s what allows you to pick up a heavy object again and again (and again) or take a hit in an endless test to earn a black belt, or squat down and thrust upward dozens of times from underneath a 250-pound log at our Kokoro Camp. Stamina is the capacity to drill down into reserves of energy, deep within caverns of the body, heart and mind, that provide the flow of power and mental toughness that, in extreme situations and circumstances, be it the known, the unknown or the unknowable, you don’t just barely scrape by with survival. Rather, you thrive, cutting into and channeling new veins of capacity you never sensed you had. Stamina is the Latin plural for ‘stamen’—the thread of life as spun by the Fates. This image fits well with the life of a special operator. The word stamina is rooted in the idea that you need to be prepared for whatever chaotic, dangerous situations that life may throw your way. You don’t have the luxury of knowing what the boundaries are – as you would with a time clock during a sporting event. So you can see why stamina is a centerpiece to SEALFIT’s training programs. You’re not just training your muscles so that you can net a PR in the gym. You’re training a unique skill: If you are going to be able to achieve and sustain the 20X factor throughout your life, you are going to need to find a bottomless well of stamina. 1. To work at near peak output for extended periods of time, with unknown rest periods. 2. To be prepared for the known and the unknown. 3. To possess stamina to move heavy objects around. 5. To work in explosive, short bursts such as a firefight or other crises. 6. To control fear and turn stress into success. 7. To keep goals very short and be prepared for whatever comes your way. As these targets suggest, improving your stamina is like working with an alloy; a blend of inner metals. Mental stamina is associated with resiliency and the ability to maintain focus in the midst of chaos and fatigue. Emotional stamina is the resiliency that comes from bouncing back quickly from setbacks. As to the physical counterpart of stamina, let’s talk briefly about how stamina differs from cardiovascular endurance. As the terms entails, cardiovascular endurance is your body’s efficiency in the exchange of gasses. In general, we’re talking about how well your physical systems can deliver oxygen from a breath of air into the working muscle cells. While the cardio components relate to gas exchange and your ability to get oxygen to your muscles, stamina relates to muscular endurance and the ability of your muscles to keep working under load. When we talk about the physiological mechanism of stamina, muscles are again a part of the discussion, but rather than the rate of oxygen supplied to the muscles, we’re focused on how well the muscle can access and utilize fuel, enabling the muscle to function under load for extended periods of time. DURABILITY: Warrior Yoga post-WOD sequence or active stretching. For beginners this workout will challenge you and begin to build your stamina. For more advanced athletes this would be one component of a longer workout that includes a strength and work capacity session. You’ll notice that the prescription for weights, 95 pounds for deadlifts or a 25-pound dumbbells for push-presses, doesn’t sound like a staggering amount of weight. It isn’t. Indeed, stamina training is best trained through moderate levels of load and intensity, but more volume, using chipper-style workouts and “Rounds For Completion” as seen above. 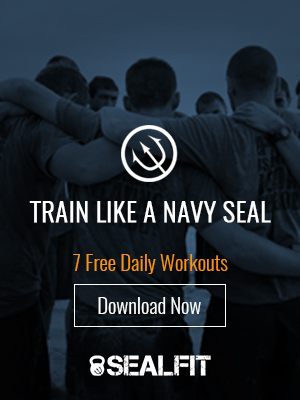 I love this combination of strength and stamina and work capacity development in SEALFIT training – it’s both challenging, extremely effective, and fun. If you’re new to SEALFIT, perform the above workout. Make good form your priority and scale where necessary, but push yourself to the very end and you’ll get a taste of what it’s like to train stamina—physically, mentally and emotionally. This is just a starting point in a long, rewarding journey. Next time, let’s talk more about what we mean by developing good form in functional movements so that we can avoid dysfunctional movement patterns that lead to injury. And most importantly, on this holiday, enjoy the national freedom that we have thankfully been blessed with for so many generations.